I love chocolate and cherry flavors together, and I found great dried cherries from Maine for this recipe. I also used bittersweet instead of milk chocolate: Not only does it have less sugar, but it has a deeper flavor, too. 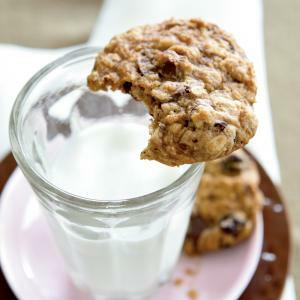 One cookie is less than 150 calories. 2. Weigh or lightly spoon flours into dry measuring cups; level with a knife. Combine flours and next 3 ingredients (through salt) in a large bowl; stir with a whisk. 3. Melt butter in a small saucepan over low heat. Remove from heat; add brown sugar, stirring until smooth. Add sugar mixture to flour mixture; beat with a mixer at medium speed until well blended. Add cherries, vanilla, and egg; beat until combined. Fold in chocolate. Drop dough by tablespoonfuls 2 inches apart onto baking sheets coated with cooking spray. Bake at 350° for 12 minutes. Cool on pans 3 minutes or until almost firm. Remove cookies from pans; cool on wire racks.